The Navy plans to invest $25 million a year beginning in 2017 in techniques to lower the cost of building its new Ford-class aircraft carriers, service officials said. “We will use this design for affordability to make new improvements in cost-cutting technologies that will go into our ships,” said Rear Adm. Michael Manazir, director of Air Warfare. 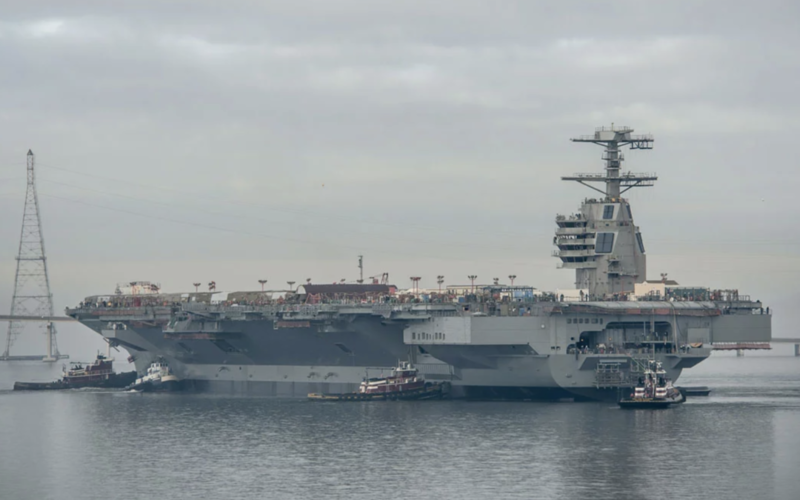 The Navy has received much criticism from lawmakers and government watchdog groups for cost overruns on its first two Ford-class carriers — the USS Ford, CVN 78, and the USS Kennedy, CVN 79. The Kennedy is being built by Huntington Ingalls Industries in Newport News, Va., and is slated to enter service in 2023. The Navy recently awarded a fixed-price construction contract for the Kennedy to Newport News Shipbuilding with incentives built in to reward cost-saving successes. “We just awarded a contract to buy long lead item materials and lay out an allocated budget for each of the components of that ship. We want to build the ship in the most efficient manner possible,” said Rear Adm. Thomas Moore, program executive officer, Carriers. Navy leaders say the service is making positive strides regarding the cost of construction for the Kennedy and plans to stay within the congressional cost cap of $11.498 billion. The Kennedy’s predecessor, the USS Ford, is scheduled for official delivery to the Navy next year. The shipbuilding effort for the Ford was widely criticized by lawmakers and analysts for cost growth that eventually brought the cost of the platform up to $12.8 billion. The Navy is testing and further developing the Ford to enter service while concurrently making progress building the Kennedy. Navy leaders have emphasized that many of the cost overruns on the Ford were due to variables encountered on a first-in-class ship. In addition, they emphasize the challenges of integrating a handful of high-tech new systems onto a single platform, suggesting that the cost overruns on the Ford class will continue to decrease as the program progresses. The $25 million design for affordability initiative is aimed at finding innovative shipbuilding techniques and strategies that will accomplish this and lower costs. Moore said the goal of the program is to, among other things, remove $500 million from the cost of the third Ford-class carrier, the USS Enterprise, CVN 80. “It is finding a million here and a million there, and eventually that is how you get a billion dollars out of the ship from (CVN) 78 to (CVN) 79. The goal is to get another $500 million out of CVN 80. The $25 million is a pretty prudent investment if we can continue to drive the cost of this class of ship down,” Moore told reporters recently. Moore explained that part of the goal is to get to the point where a Ford-class carrier can be built for the same amount of man-hours it took to build their predecessor ships, the Nimitz-class carriers. “We want to get back to the goal of being able to build it for historical Nimitz-class levels in terms of man-hours for a ship that is significantly more capable and more complex to build,” Moore said. The money will go toward new approaches and explore the processes that a shipyard can use to build the ship, Moore added. “They’ve made a significant investment in these new welding machines. These new welding machines allow the welder to use different configurations. This has significantly improved the throughput that the shipyard has,” Moore said, citing an example of the kind of thing the funds would be used for. Others include whether new coatings for the ship or welding techniques can be used and whether millions of feet of electrical cabling can be installed in a more efficient manner, Moore added. Other cost-saving efforts include the increased use of complex assemblies, common integrated work packages, automated plate marking, weapons elevator door redesign and vertical build strategies, Navy officials said. Shipbuilders could also use a new strategy of having work crews stay on the same kind of work for several weeks at a time in order to increase efficiency, Moore said. And some of the construction work done on the Ford while it was in dry dock is now being done in workshops and other areas to improve the building process, he added. Senior Navy leaders and Huntington Ingalls Industries executives have made numerous public statements that lessons from the construction of the Ford were being harnessed and applied to the Kennedy as a way to control costs. For instance, Navy leaders said that new construction methods were being used on the Kennedy and that billions in non-recurring engineering costs from the Ford would be avoided because the designs were completed before construction of the Kennedy began. Built with a host of new technologies to improve operational performance and efficiency compared with Nimitz-class carriers, the Ford-class ships are engineered with slightly larger deck space to allow for a greater sortie rate, more computer automation to reduce the need for manpower, and an electromagnetic catapult to propel jets off the deck. The new electromagnetic catapult system and advanced arresting gear are designed for smoother, safer and more efficient takeoffs and landings compared to the steam catapults used on today’s carriers. Also, the Ford-class carriers are being built with three times the electrical power-generating capacity compared to Nimitz-class carriers, Moore said. The USS Ford will have four 26-megawatt generators bringing a total of 104 megawatts to the ship. Despite these technological advances and the challenges of integrating them, lawmakers have been quite vocal with concerns about cost growth of the Ford-class. The Senate Armed Services Committee recently proposed a series of new measures in the 2016 defense bill designed to control costs and provide oversight to the carrier program. The new provisions direct a Comptroller General review of Ford-class carrier cost estimates and also limit some procurement funds for the Kennedy and its planned successor, the Enterprise. Advance procurement funds for the Enterprise will be limited by $191.4 million until the Navy provides a justification for the costs and certifies that the design will repeat CVN-79. The Senate committee also directed the Navy to complete two specific reports — one of them on cost-control options for CVN-79 and another exploring potential future platforms designed to supplement or replace the Ford-class carrier. Earlier this year, the Navy began a formal study to assess ways to lower the costs of aircraft carriers, explore alternatives to the big-deck platforms for the long-term future and increase competition among vendors. The study, expected to last about a year, will examine technologies and acquisition strategies for the long-term future of Navy big-deck aviation in light of a fast-changing global threat environment, service officials said.